Home / WeChat Wallet FAQ / How to Avoid WeChat Pay Restircted & Transaction at risk of Fraud? 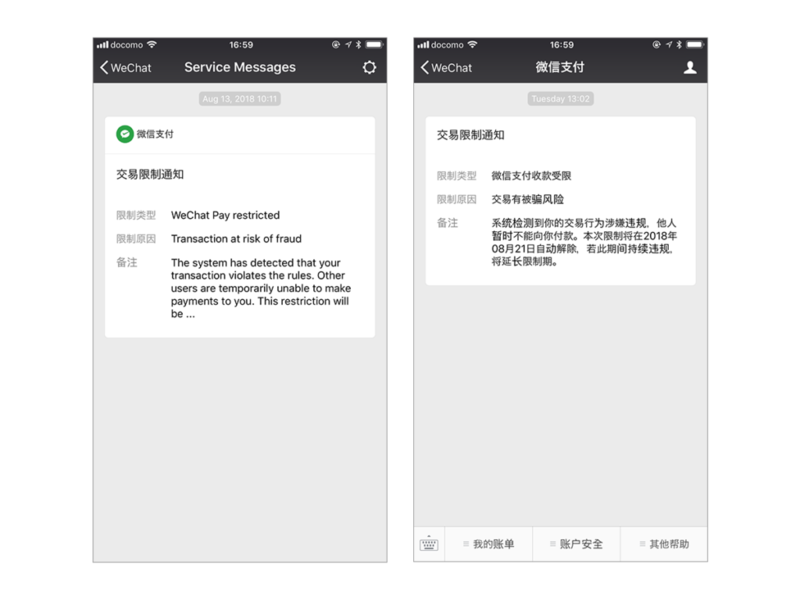 How to Avoid WeChat Pay Restircted & Transaction at risk of Fraud? As we know, WeChat wallet has been most popular mobile payment method around China. Even more and more foreigners also dowanload a WeChat app to take a try before they travel to china or do business with Chinese. But because of foreigners WeChat wallet is not verified by Chinese ID and Chinese Bank, According to China fund policy. WeChat will limit foreigners payment if they don’t have a Chinese id. What you do will cause suspend by WeChat? transfer money to the same people frequently instantly you receive money. Once your WeChat wallet was restricted , WeChat will unlock your payment until the date it shows u. Remember it, Keep less money in your wallet , generally I suggest no more than ¥1500, and when you need WeChat money, Just Place an order at yayaka WeChat top up service. Transaction is better than transfer, you may know the difference between transaction and transferring. if someone want to transfer big amount money. For example, wholesalers send money to Chinese sellers, suggest ask your seller create a link on taboo or 1688.com and ask yayaka pay for you. Hello, I am not able to see when my wechat pay will be unrestricted, everytime I click on the message, it will direct me to the self verification page in chinese, where they ask you to face record, but I think it is just for real Chinese people. What should I do? Do I just wait for it to be unrestricted? How long does it usually take for the restriction to be taken down? People not being able to transfer me money because of this.Thank you. generally it takes 3-7 days to unresitricted. But I see someone is blocked forever. If being restricted forever, it means no way for it to be unrestricted?! 😲 What should we do if that happens? We can still pay right, even though we can’t receive? what is the procedure for face verification.? how to do this face verification on wechat, my friends are unable to sent me money. for foreigners, it will not work for the procedure of face verification. the only way is ask a Chinese friend to verify with his information. Thank you for your reply,how my chinese friends verify my account,how i can send the request of verification to my friend.? How long was your payment restriction? Intento introducir los datos de mi tarjeta (VISA) europea y no me deja recibir el dinero. It appears that WeChat has changed the rules. Previously you could receive money from a friend. Now, after the beginning of the year WeChat is blocking any incoming transactions unless you have a mainland China bank card. I’ve been using WeChat in China for years and this change is horrible. Until it’s fixed is first not using any money transfer site else you are likely to don’t yourself fighting to get your funds refunded to you after the transaction fails. yes, new policy changed since 18th Feb 2019 – about 22th Feb 2019 From WeChat Official to stop WeChat account which verified with foreigner card to receive money. But if there is balance still in their wallet, they can still pay. I don’t know when this policy will change back again. But at present, better to ask your agent to pay to your seller, I think it is best choice. Hello, I am not able to see when my wechat pay will be unrestricted, everytime I click on the message, it will direct me to the self verification page in chinese, where they ask you to face record. What I understood from the other comments is that only Chinese people can verify this. How do they verify? When I try to do it myself it says something about network error and to try again. Do I just wait for it to be unrestricted? People not being able to transfer me money because of this. Btw I do have a Chinese bank account. Thank you. Hey guys ! My WeChat pay was blocked after I received this message about the ID verification. But I found that I could still send red packets ! But the maximum amount is 10 RMB per packet… Anyway.. it took me some time and a few hundreds red packets, but I managed to send all my money to a friend. I hope this can help you if you have the same problem. Wendy on How to Avoid WeChat Pay Restircted & Transaction at risk of Fraud? pinkdiva6669 on How to Avoid WeChat Pay Restircted & Transaction at risk of Fraud?